Admit it - theme restaurants are kitschy fun, especially for kids. Places like Hard Rock Cafe, Planet Hollywood and Medieval Times serve up overpriced portions of food alongside slices of nostalgia, memorabilia and other eye candy that can keep children occupied while waiting on their meals. While in Atlantic City over a late summer weekend with the boys, we wanted to try someplace different for dinner without spending outrageous amounts of money at a casino-restaurant. (I'm talking to you, Bobby Flay Steak.) We settled on the Rainforest Cafe (2201 Boardwalk, 609-345-5757), on the Boardwalk adjoining Trump Plaza. I knew that the restaurant didn't have a gluten-free menu, but my wife called ahead and was assured that the kitchen could accommodate dietary requirements. As the name suggests, Rainforest Cafe is a restaurant that features a faux rain forest, complete with waterfalls, mist, trees and animals - robotic, of course; I doubt the health department would allow real ones to roam the kitchen. A walk-through aquarium separates the lobby from the dining room, where a simulated thunderstorm occurs every half-hour. We were particularly impressed with the ape (or was it an orangutan?) that swung from the branch right above our table. After being seated, we advised our server of our older son's diet, and the chef soon came out to provide suggestions for ordering. Safe options included many salads, bunless burgers, and several seafood choices. 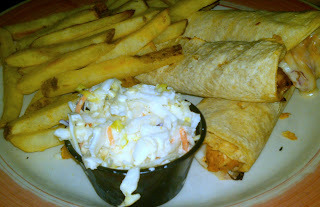 Our son settled on the Bamba's Barbeque Wrap, a shredded chicken wrap with spicy barbeque sauce and cheese that came with a side of cole slaw. The chef personally brought out the dish to the table, substituting three smaller corn tortillas for a two larger wheat flour wraps. He also prepared a side of french fries in a pan instead of a deep fryer. We opted not to have dessert, but ice cream is available. Chain restaurants - and themed ones in particular - can be hit-or-miss in preparing gluten-free meals. It's always nice when we can go to one where special requests are easily handled, even if it's a place where more than just people hang out. The Rainforest Cafe in AC is my son's favorite place on the shore, and we've never had a problem eating there - both of us are celiac, with quite sensitive systems. I like their salads, which make a nice change for me from the endless "burger, no bun" that I usually end up with in a chain restaurant.